Cedar shakes and striking gables with decorative scalloped insets adorn the exterior of this lovely coastal home. The generous great room is expanded by a rear wall of windows, with additional light from transom windows above the front door and a rear clerestory dormer. The kitchen features a pass-thru to the great room that doubles as a breakfast/snack bar. The dining room, great room, and study all access an inviting back porch. The master suite is a treat with a private balcony, his and her walk-in closets, and an impeccable bath. Upstairs, a room-size loft with arched opening overlooks the great room below. 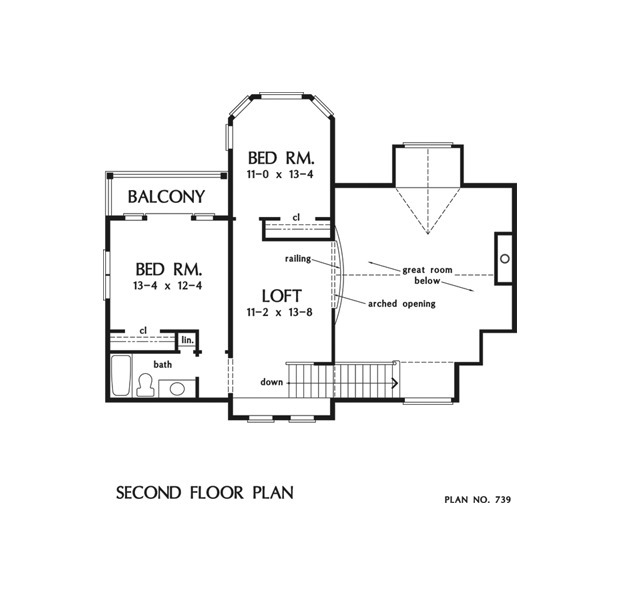 Two more bedrooms, one with its own private balcony, share a hall bath. 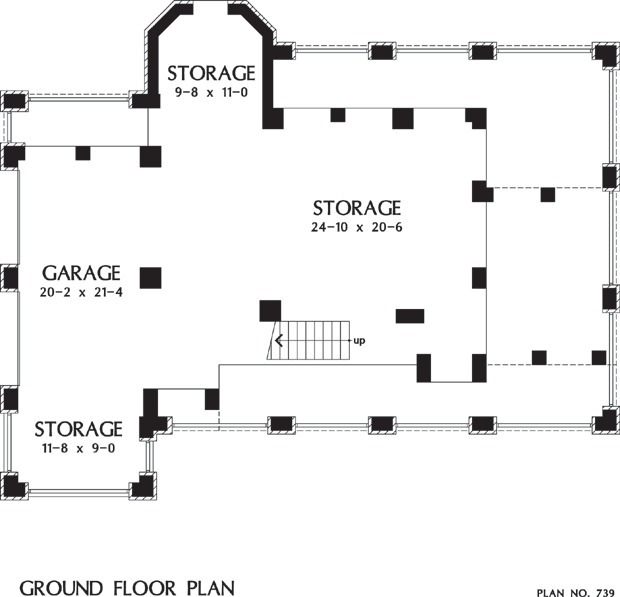 1st Floor: 1650 Sq. 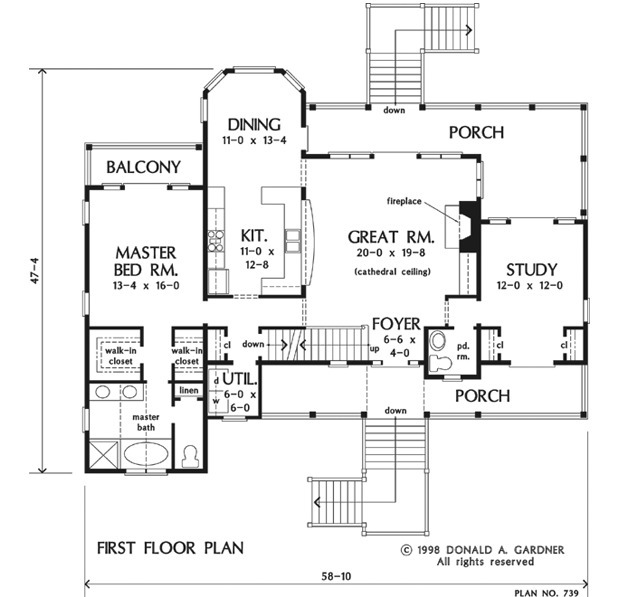 Ft.
2nd Floor: 712 Sq. Ft.
Other Storage: 787 Sq. 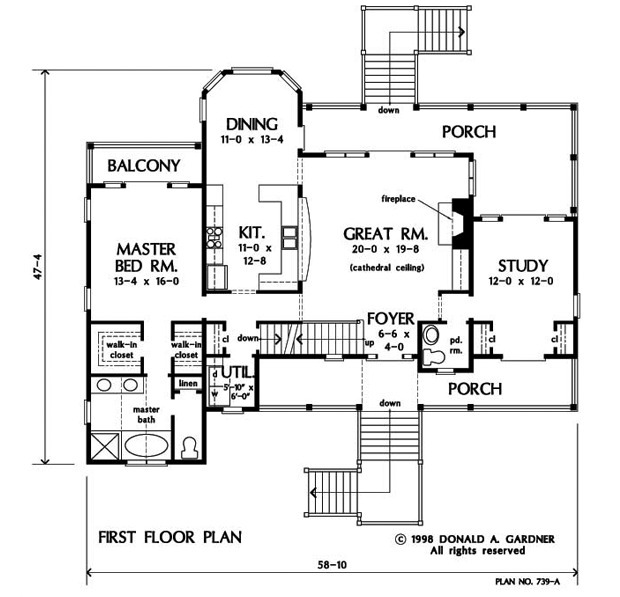 Ft.
House Dimensions: 58' 10" x 47' 4"
Great Room: 20' 0" x 19' 8"
Master Bedroom: 13' 4" x 16' 0"
Porch - Front : 38' 2" x 6' 4" x 0' 0"
Porch - Rear : 33' 0" x 6' 0" x 0' 0"
Media Room : 12' 0" x 12' 0" x 9' 0"
Loft / Study : 11' 2" x 13' 8" x 8' 0"
Balcony : 13' 10" x 5' 0" x 0' 0"
Other : 13' 10" x 5' 0" x 0' 0"
Foyer : 6' 6" x 4' 0" x 14' 4"
Dining Room : 11' 0" x 13' 4" x 9' 0"
Great Room (Cathedral): 20' 0" x 19' 8" x 20' 0"
Kitchen : 11' 0" x 12' 8" x 9' 0"
Master Bedroom : 13' 4" x 16' 0" x 9' 0"
Bedroom #2 : 13' 4" x 12' 4" x 8' 0"
Bedroom #3 : 11' 0" x 13' 4" x 8' 0"